Please see the chart below which will give you an idea about the lengths of necklaces to determine your desired length. The standard ring size for Marco Bicego rings is a size 7. To find your ring size, please print this page at 100% and match one of the circles below with the inside of one of your rings. Half sizes are determined if your ring size falls in-between two of the circles. Please note, you may want to go up a 1/2 size for wider banded rings. How do I measure my wrist for a Marco Bicego Bracelet & Bangle Size? Marco Bicego bracelets are made for an average size 7" wrist. Please note Marco Bicego's average bracelet length varies to accommodate the style and width of the bracelet. 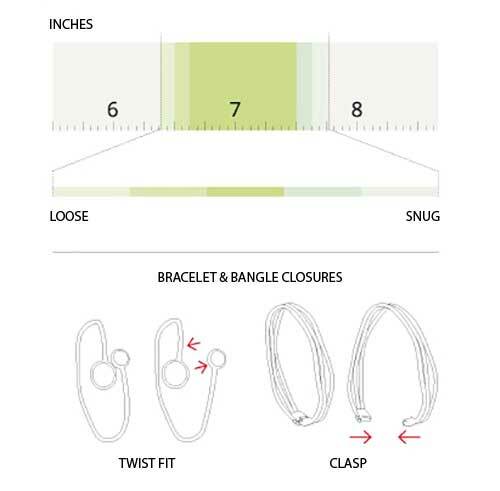 Measure your wrist where you like to wear your bracelet, typically above your wrist bone, to determine your size. How to choose the Earring Style For You. Please see the earrings silhouette style chart below which will give you an idea about the style of earrings you can choose from.